Watering should be done deeply and infrequently to promote a strong and healthy root structure. Shallow and frequent watering promotes surface roots. This creates a lawn that will quickly wilt, curl and die with a heat wave. Dry grass won’t bounce back and foot prints remain visible after you walk across your lawn. Frequent lawn watering also encourages weed germination. Over-watering contributes to growth of fungus and disease. Watering should moisten to a depth of at least 8 inches. You can estimate how much water this will take by turning your sprinklers on for 15 minutes. Wait a minimum of 4 hours and dig a small test hole and see how deep the moisture has penetrated. 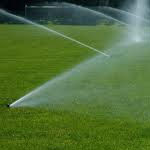 If your lawn is only moist to a depth of 4 inches, then you will need to double your watering time to 30 minutes. Putting in a new lawn? Then always start with a premium sod from your local sod farm. Use Far West Turf Farm. They are your local Vancouver, WA and Portland sod farm.